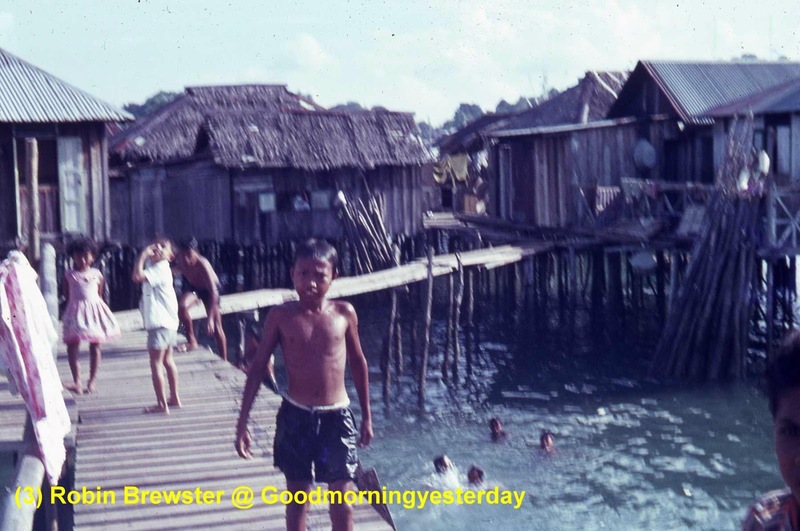 Can you identify the kampongs in these photos? I certainly can’t. I know it’s tough, but GMY readers have always risen to the challenge in the past. Photos number 1 and 2 were sent by Mike Robbins and Photos number 3, 4 and 5 by Robin Brewster. Of course if you could identify the people in the photos that would be even better; especially the kid in Photo number 1; LOL. I don’t know about you. But I always find it a joy to see the happy faces of kampongs kids; especially when the kampong is from Singapore. By the way, if you have watched the documentary Lost Images featuring videos by Ivan Polunin, you will see similar scenes of kampong kids frolicking in the sea. Maybe it’s the same place. 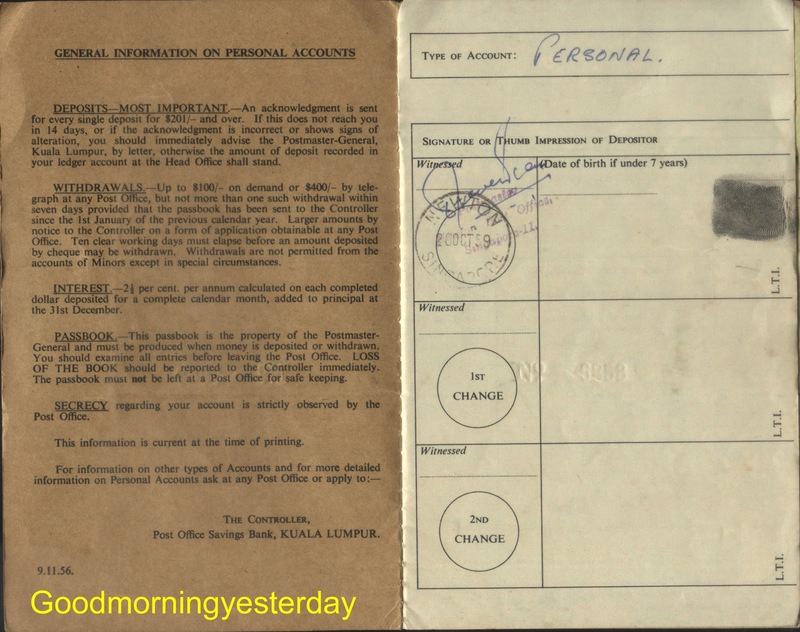 We arrived in Singapore at the start of May 1961. My brother and I were having such a good time that we scarcely noticed that we had missed an entire term of school. It wasn’t until September of that year that we restarted our education. At St. Andrews School, off Woodsville Circus. I don’t know why St. Andrews was chosen, but I know that it had a good reputation, so I guess it must have been recommended to my parents. I vaguely remember an appointment that we attended, with our parents and a senior person from the school, possibly the headmaster. We were lectured in the ethos of hard work and discipline, and the meaning of the Tennis Racket symbol … Up and On. The school was quite a long way from Woodlands, and we had the benefit of being transported in a Metal Box vehicle. Sometimes it was a Morris Traveller, but on a good day it would be one of the Bedford vans. I loved riding in these vans, with the doors wide open (no Air Con) and no seat belts. Feeling the wind from an open door was the perfect antidote to the incessant heat. We got to know the Metal Box drivers. Tan Wah Tin and Tan Jun Tek are the two that I remember (there were plenty of Tans in Singapore). There was also a Malay driver, whose name I have forgotten. One day he was asked to keep us occupied for a couple of hours, as my Mother was busy with something. He took us across the causeway to his home in Johore Bahru. It was wonderful; a wooden house on stilts, in a rural village with chickens running about. It was another world. His wife served us Frazer and Neave orange juice, and their children came in and gawked at us. St. Andrews was an Anglo-Chinese school. In my class I was the only white boy. There were one or two Indians and Malays, but most of the boys were Chinese. I was an ethnic minority, before I had even heard the expression. 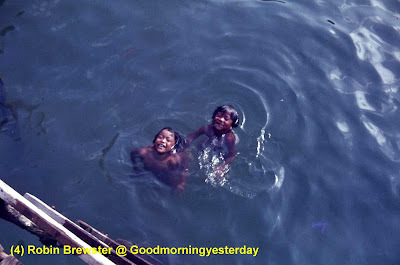 I was occasionally picked on by an older boy, on account of my race, but the boys in my class were fine. We made friends the way children do at school. My theory is that children are children, the world over, and they are attracted to each other regardless of race. My recollection of the school in 1961 is that it was a large building set in a semi-rural location. The playing fields were extensive, and the Kallang river formed one boundary. We were warned to stay away of the river, on account of the aggressive crocodiles, which had been known to attack humans. I never went near the river. There was a canteen where we could buy food at break time for a very modest sum. I think a bowl of noodles was just a few cents. I had other plans for my money. I would make do with a bag of prawn crackers, and I spent everything on tiny plastic soldiers. By the end of term I had enough to recreate the Battle of the Somme in my bedroom. A drink was essential, and I learned to appreciate the delights of 7-Up and F&N out of the fridge. Back in England, refrigeration was still a luxury for the wealthy. And unnecessary most of the time. We were on the morning shift. In the afternoon, a different set of boys attended. In England we were used to staying at school until mid-afternoon, but there was no school on Saturday. So I guess it balanced out. The first few minutes of school were intense peer-bonding session. Stamp-collecting was very popular, so we would barter stamps, or other trinkets. We had a young Chinese lady teacher, who took us for all classes except Chinese. I don’t remember much about her. She was both strict and nice, if that is possible. There was one major understanding, on account of my Yorkshire English being misinterpreted. During a stamp-trading session I got into an argument with a boy who I believed had stolen my 1953 Singapore $1 Coronation stamp. The teacher came to intervene and ask what the problem was. “He pinched me stamp.” I tried to say. But I only got as far as “He pinched me …”. The teacher pinched the other boy on his arm and said “That will teach you to pinch Timothy!”. If I hadn’t been so shocked I would have tried to explain that in Yorkshire “pinch” means steal, whereas “nip” means pinch. Oh well. He was in tears and I never got my stamp back. 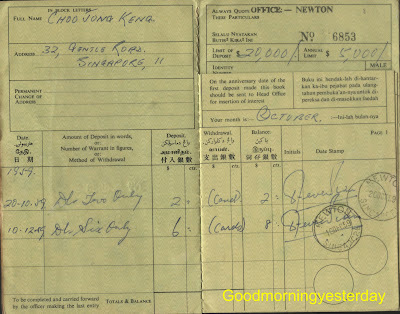 The non-Chinese boys were excused Chinese lessons. I think we went to a different room where we were allowed to read. The big bonus was learning Malay. I’ve forgotten it now, but it was fun. It was taught with picture books, and was not especially difficult. I would have liked to learn some Chinese, but I think that would have been a totally different proposition. Anyway, the Chinese boys had been speaking it all their lives. As for the rest of the lessons, there was a big problem. We were doing things that I had learned two years earlier in England, and I was scoring 10/10 in every assignment. It seems that children in Singapore started school at a later age than in England. Whatever the explanation, my parents realised that there would have to be a change. There were two choices. Elevation to a higher age-group would have given us more a challenging and suitable level of studies, but we would have been with boys who were two years older. The other option was to put us in a British Services school. And that’s what happened. 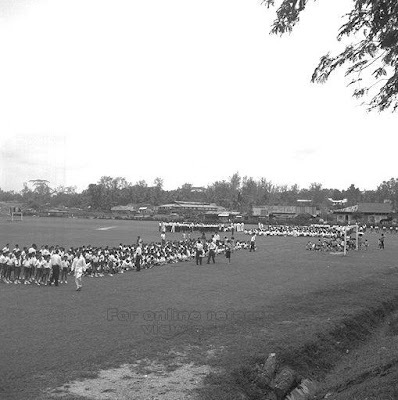 From January 1962 we attended the Royal Naval School, in the naval base at Sembawang. I was sorry to leave my new friends at St. Andrews after such a short time, but the naval base was another adventure. I only have a couple of photos from St. Andrews, showing a rope bridge that was made by the Boy Scouts on the occasion of a fund-raising day. From Google earth, it looks like the main school building still exists, although the field where we played football at break time is now underneath the Pan-Island Expressway. It would be fun to see some pictures of the old place, either from then or now. This 1967 photo of the big field in St Andrew's is from the National Archives' Picas website. Related post: Showdown at Woodsville. My father worked for the Metal Box Company. He served his apprenticeship at the factory in Shipley, Yorkshire, where the can-making machinery was made. 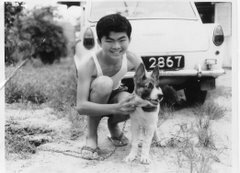 In 1961 he was posted to Singapore as factory engineer for the Metal Box factory at Woodlands. Metal Box owned some bungalows on Marsiling Road. One of these was our home for the first few months of our stay. Marsiling Road in 1961 was a completely different road to Marsiling Road today. The old road has been lost to development. The old street map shows its position. The red cross shows the approximate location of the bungalows. This area of Woodlands was still semi-rural. Apart from the Metal Box factory, there weren’t many other major buildings in the area. Just beyond the end of our drive was a rubber plantation. We had a clear view across the Straits to Johore Bahru. In hindsight, it was an immensely beautiful property and location, and it was a great privilege to live there, if only for a few months. At least, I thought it was. My mother was not so happy. It was quite isolated, and I think she felt rather vulnerable. In hindsight, she may have had a point. I can’t remember how many bungalows there were. Two or three. I do remember our neighbours, Mr and Mrs Bloody Robinson. Mr Bloody Robinson (as I called him) was a colleague of my father, and I recall that he liberally peppered his conversation with the “B” word. 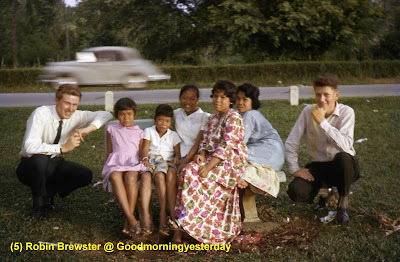 These days, we hear much worse, but back in 1961 it wasn’t considered nice to use the “B” word in the presence of ladies and children. The bungalow itself was a fine property, with a spacious living area, and separate quarters for Kim, the amah. There was also a tennis court, which we hardly ever used. But what fascinated me was the wildlife. Birds, bats and monkeys in the trees. Lizards, snakes, termites, ants, butterflies, caterpillars, centipedes and even the occasional giant rat. The whole garden was teeming with life. Yorkshire is not without its wildlife. From my window I can observe several species of birds, and the occasional squirrel. But there is nothing like the variety of species, the colours and the sounds that existed in that garden. I conducted experiments. For example, placing red ants in a jar with black ants. They fought like gladiators. Our first snake took us by surprise. There are no snakes in Yorkshire. My brother, Richard, spotted a curled up snake in the flower bed. He told my father that he had seen a dead snake. Dad wasn’t sure that it was dead, and sure enough, when he prodded it with a broom stick it sprung into action. Dad killed the snake and buried it. Better safe than sorry. I was sorry to see it killed, but we didn’t know if it was poisonous. We were novices in this wild place. On another occasion I discovered a flying lizard. I saw it glide across the grass and land near the drive. I knew what it was straight away. I had read about flying lizards. I wanted to catch it, so I ran indoors and grabbed a jam jar. I placed the jam jar behind the lizard, then put the lid in front if it. The lizard turned round and launched itself into the jar. What a prize! I took it to school for the nature table. It didn’t stay there long. One of the other boys felt sorry for it and released it. I was annoyed. I didn’t care about the lizard’s welfare. I just wanted my brownie points. One evening, returning home in a taxi, an enormous iguana crossed Marsiling Road. It must have been four feet long, maybe more. The taxi driver was very interested, and stopped the car to chase after it. I don’t know what he wanted, but my mother had to persuade him to drive us the rest of the way home. I don’t know the whys and wherefores, but we left Marsiling Road after a few weeks of house-hunting. Presumably the company bungalow was a temporary facility for newly arrived employees. All good things come to an end, and our stay at Marsiling Road lasted only seven months. But the impressions have lasted a lifetime. It would be interesting to know how much of the wildlife has survived the urbanisation of Singapore, or whether all the interesting animals have retreated to the nature reserve. It is fifty years since the Light family landed on Planet Singapore. I was seven years old, almost eight. I call it Planet Singapore, because it was so different from where we came from, it could almost have been a different planet. I was growing up in a grimy old mill town on the outskirts of Bradford, Yorkshire. We lived in an old stone terraced house with an outside toilet, coal fire and no bathroom. On bath night my brother and I would splash around in a tin tub in front of the living room fire. Happy days. One day my father came home with a broad grin on his face, embraced my mother, and then announced that we would be going to Singapore. My imagination ran wild. I had no idea where Singapore was, but I was picturing grass huts, grass skirts, lions, tigers, snakes and crocodiles. My father was working for the Metal Box company, and I imagined the factory in Singapore to be a very large grass hut. The first big adventure was the flight. I had never been near an aeroplane before, and the QANTAS 707 was enormous. We argued about who was going to have the window seat, and my brother and I had to take it in turns. I will never forget the route; Heathrow – Rome – Cairo – Karachi – Calcutta – Bangkok – Singapore. And the flight would continue to Darwin and Sydney. At each stop we would disembark for an hour, claim our free drink in the transit lounge, and go back on board for the next leg. So many exotic places in less than 24 hours. In those days it was common for Far-East flights to make multiple stops. It was night time when we landed at Paya Lebar. My father was there to meet us (he had gone ahead, a month earlier), and with him were a couple of Chinese friends. One was Tan Chen Chok. I don’t remember the other. We became good friends of the Tans over the next few months, but I lost track of them. 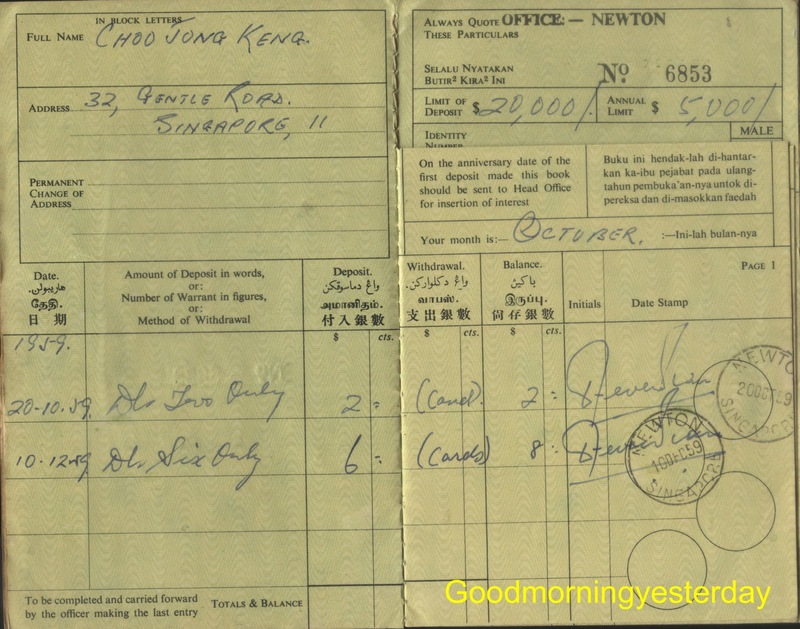 They lived on Keng Chin Road. I don’t remember Mrs Tan’s name, but they had two children – Ronnie and Alice, and maybe a baby too. It would be interesting to track them down. 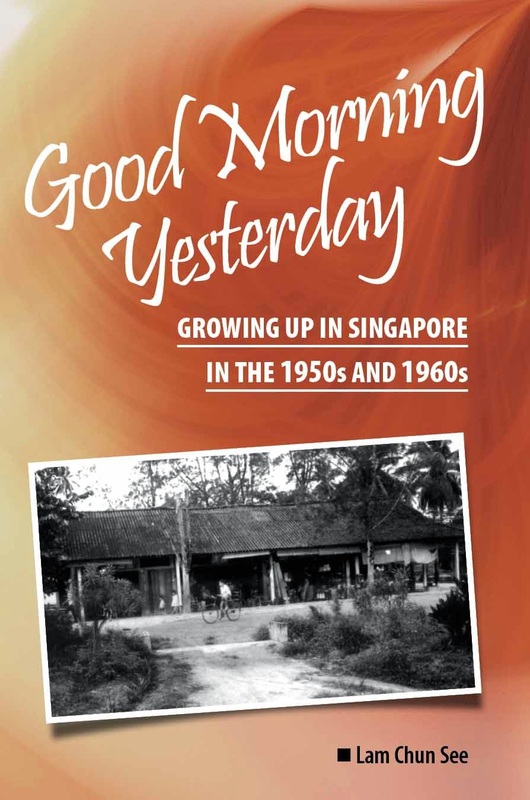 I was only half awake as we drove to our temporary home – a bungalow on Marsiling Road. I woke in time to see the illuminated METAL BOX sign as we went past a very modern factory. And the company bungalow was anything but a grass hut. The next thing I remember was waking up in the most intense heat I had ever experienced. Everything was different. It was about 8am and the insects were making a constant noise. There was a smell … not unpleasant … that I couldn’t identify. The same smell that was everywhere on the island. Singaporeans who grew up on the island wouldn’t notice it. Just as we didn’t pay attention to the stench of coal smoke back home. I went outside to our extensive garden, and I almost recoiled from the heat of the sun. It didn’t stop me from exploring. And the garden was alive, with insects, birds, butterflies and lizards. Suddenly I was Tarzan in the jungle. As long as I lived in Singapore, I was always fascinated by the living creatures. On that first day, my father took us down town to see the sights and to do a bit of shopping. My memories are vague, but I do remember Queen Elizabeth Walk, the Singapore River (with its hundreds of sampans and a powerful smell), Collyer Quay with its skyscrapers (presumably bank of China and Asia Insurance buildings). We walked through Change Alley … a wonderland for little boys like me. I had never seen anything like those tinplate motorised toys, and if I had had any money I would soon have spent it. The shopkeepers were animated and pushy … not in a bad way, but they needed to get your attention. We emerged into Raffles Place. My final memory of the day was of a street hawker selling plastic tumblers. They were unbreakable, he said. He demonstrated this by bouncing one off the pavement and catching it. My mother thought this was a great idea, and she bought a set. Well, that was my first 24 hours in Singapore. I was hooked. I did notice, though, that whilst we were living in luxury (there is no other word for it, especially when compared with our conditions in England), most of the local population were living in far worse conditions. I was happy enough with this, and too naïve to imagine that there might be any injustice or resentment. More observations to follow …. 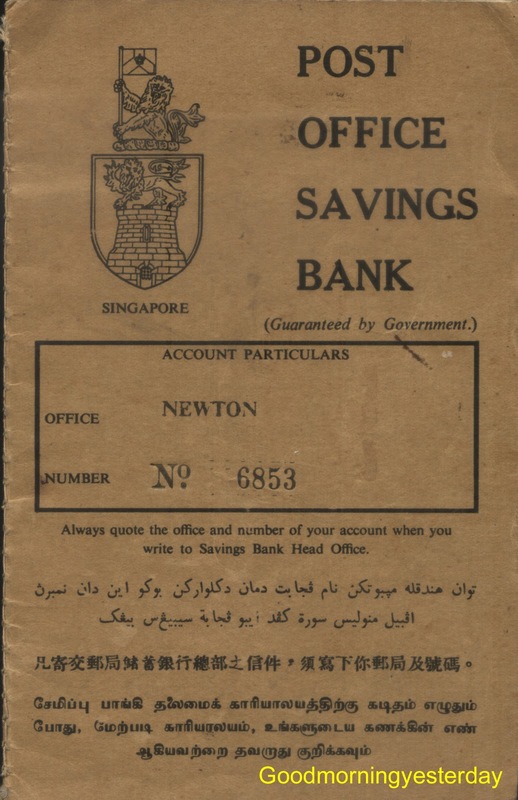 Unfortunately, the minister did not have his original POSB passbook with him, and so most of the audience still had no idea what such a passbook looked like. But no worries. You can always come to Good Morning Yesterday. 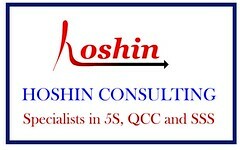 Thanks to my friend Jong Keng from ACS, I am able to satisfy your curiosity. This is the front cover of the bank book. Notice, first of all, that it is not blue in colour. 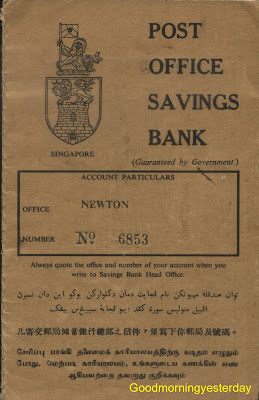 Notice also that the instructions are in Singapore’s 4 official languages; with the Malay instructions written in Jawi script. Older Singaporeans would have seen such writing in many official documents when we were young. And over in Malaysia, you will still be able to see some shops using Jawi in their signboards. You must be wondering what was the interest rate. Well, as you can see from the inside cover, it’s 2.5% p.a. 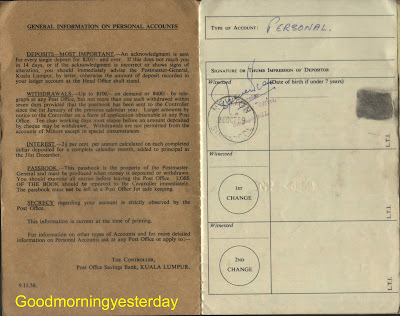 And interestingly, it is signed, The Controller, Post Office Savings Bank, Kuala Lumpur. And this is the inside of the passbook. I wonder how much my friend’s $8 is worth after half a century? Do you know the meaning of these instructions found on the cover of an old document? Hint: The front cover of this 1959 booklet contains this logo.